This story contains language which you may find offensive. 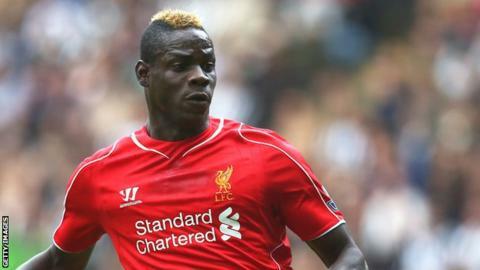 Liverpool striker Mario Balotelli has apologised for a post on social media which appeared to contain anti-Semitic and racist references. Balotelli, 24, quickly deleted the post from his Instagram page of Nintendo computer game character Super Mario. Before his apology, the Italian had tweeted to deny the text of the post was offensive. The Football Association has asked Balotelli for his observations and given him until 18:00 GMT on Friday to respond, while Liverpool say they will speak to the player. A spokesman for anti-discrimination group Kick It Out told BBC Sport: "Kick It Out has been made aware of Mario Balotelli's Instagram post by a Twitter user and has now forwarded it on to the FA to look into the matter." The picture posted had an image of Super Mario with the heading "Don't be a racist!" The text read: "Be like Mario, he's an Italian plumber, created by Japanese people, who speaks English and looks like a Mexican." It finished: "He jumps like a black man and grabs coins like a Jew." Responding to criticism on Twitter, Balotelli tweeted: "My Mom is Jewish so all of you shut up please." He also described reposting the image as "my unlucky moment". However, he later wrote: "I apologise if I've offended anyone. "The post was meant to be anti-racist with humour. I now understand that out of context it may have the opposite effect. "Not all Mexicans have a moustache, not all black people jump high and not all Jewish people love money. "I used a cartoon done by somebody else because it has Super Mario and I thought it was funny and not offensive. Again, I'm sorry." A Liverpool spokesman told BBC Sport: "We are aware of the posting which has since been promptly deleted by the player. We will be speaking to the player about the issue." Speaking after Tuesday's 3-1 win at Leicester, manager Brendan Rodgers said: "I don't know hardly anything about it, I have been busy getting the team ready for this game. "I will probably find out more about it." Jewish Leadership Council chief executive Simon Johnson, a former FA executive, said Balotelli should face action. "We abhor all forms of racism, wherever it is found," Johnson told the Daily Telegraph. "We call upon the FA to investigate this offensive social media post and to take action if appropriate if we are to succeed in kicking racism out of football." Sports media trainer Alec Wilkinson told BBC World News that some players have the wrong attitude towards social media. "There are those that are famous, earn lots of money, with a sky-high profile, who think 'What can you teach me? I can say what I like, it won't damage me,'" he said. "We spend a lot of time explaining to them it's good for them to take the pressure off themselves, to understand how the media works, how you can offend people." Burnley are among the clubs which issue players with a code of conduct governing social media usage, but their media manager Darren Bentley says a common-sense approach is paramount. "We sit them down at the start of the season, but we don't constantly hammer the message home," he said. "We treat them like adults, not kids." In September, Merseyside Police investigated racist remarks made to Balotelli on Twitter after he posted a message during Manchester United's 5-3 defeat by Leicester City.